***You can find retired prints and colors HERE! The GroVia® Hybrid system is a revolution in cloth diapering. The innovative cloth diaper Shell is designed to allow for multiple wears between washes and uses the industry's best materials. 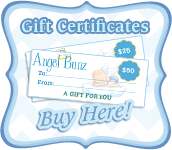 For use with our Soaker Pads, BioSoakers, and other absorbent diapers. Choose between Hook & Loop closure or Snap closure! What is the GroVia® Diapering System? GroVia® is a modern, one-size diapering system. Its unique, waterproof shell and organic cotton soaker pad minimizes waste and cost. When the soaker pad is wet, simply replace with a fresh, dry one! 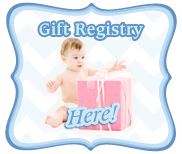 You can also choose from the new stay dry soaker pad when you want to keep baby's skin dry. GroVia® is designed so that the outer shells may be used for multiple diaper changes. If the soaker pad is wet, simply snap in a fresh one and you are ready to go. If the shell is wet, allow it to air dry and use for the next diaper change. When your GroVia® Shell is soiled or very saturated, start fresh with a new GroVia® Shell. Most GroVia® System users will find that using 2-4 GroVia® Shells are enough per day, although newborn babies may need more. How does the one-size feature on my GroVia® work? GroVia® will fit MOST babies from 8-35 lbs. The GroVia® Shell features three sets of rise snaps that adjust to fit your baby. Our unique one-size Organic Soaker Pad fits from 8-35 lbs as well. 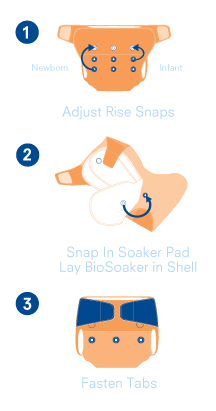 Newborn/Small Infant Setting: Snap your GroVia® Shell rise snaps on the lowest setting. Snap your soaker pad into the shell and simply flip the front of the soaker pad in towards baby. Fastened diaper on baby. Infant Setting: Snap your GroVia® Shell rise snaps on the middle setting. Snap your soaker pad into the shell. Tuck the front of your soaker pad down, while pulling the front panel up and fasten on baby. How to care for your GroVia® Diapering System? First and foremost it is important to wash and dry your Organic Cotton Soaker Pads at least 3-5 times prior to use. They will not be fully absorbent for up to 10 washes. You will find that your laundry loads will be a third of the size of your regular laundry loads! This may seem obvious but, whiteners, bleach, vinegar, enzyme cleaners and fabric softeners are not your diaper’s friends and will void all warranties. How to avoid leaks with your GroVia® System? First and foremost your GroVia® Soaker Pads must be washed and dried on hot 3-5 times prior to use. Keep in mind that they will NOT reach their maximum absorbency for up to 10 washes. GroVia's®Organic Cotton Soaker Pads while very absorbent do not contain the SAP (super absorbent polymer) gels that make disposable diapers hold ridiculous amounts of liquid. This means you should plan on changing baby every two hours. For naps, nights, car trips and older babies we highly recommend adding a GroVia Booster to increase absorbency without adding much bulk. Refrain from using petroleum based diaper balms as this coat your Organic Cotton Soaker Pads affecting their ability to absorb liquid. A good alternative is Magic Stick. Currently available in: Adventure, Astro, Ballot, Calico, Chiffon, Citrus, Cloud, Funfair, Haze, Lotus, Onyx Stripe, Ophelia, Persimmon, Tex, Topaz, Vanilla, Woodland Remix, Heartspring. This list is subject to change based on current inventory. I love Grovia, especially the H&L! I have the adventure wetbag and just had to have the matching cover!